Concentric Three – M5 Construction Update 1! I’ve now finished the cross-over simulation and I’m moving on to the next stage of building the first cross-over prototype and starting the listening tests. The cross-over is very simple and uses a LR4 filter topology (acoustical) between the tweeter and mid and a LR2 topology (acoustical) between the mid and woofer. The cross-over consist of only 12 parts and all sections are second-order electrically, besides the tweeter section which is third-order electrically in order to achieve an acoustical LR4 frequency roll-off. Note! The woofer’s are connected with reverse polarity. The tweeter level can be adjusted by changing the value of the single resistor R1. R2 and R3 can be replaced with one resistor if it can handle >20W. I don’t reveal the actual component values until I’ve evaluated the cross-over prototype. The cross-over schematic is only used here to inform how the cross-over looks like. 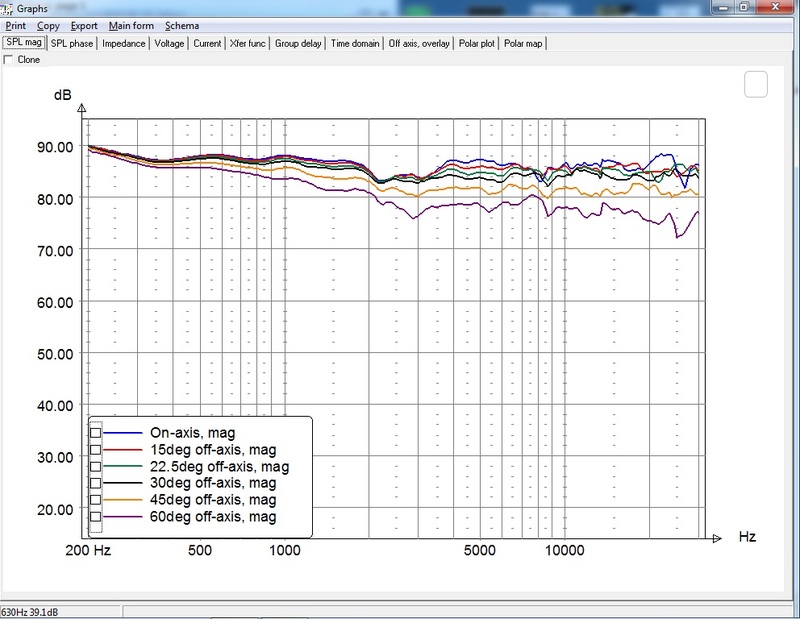 Depending on the listening tests and further measurements it can be changed little or completely. As in most of my designs the cross-over is optimized from the 15deg off-axis measurements and thus, the loudspeaker is intended to be used with none or little toe-in when setup. Using the 15deg off-axis measurement generally means that you have a less pronounced baffle diffraction influence in the frequency response when optimizing the cross-over. Generally I’m optimizing the speaker cross-over to have equally good phase behavior between 15-30deg off-axis frequency response, rather than having a good phase response at the on-axis measurement and a deteriorating phase behavior as you go off-axis. When optimizing around the 15deg off-axis measurements, the on-axis frequency response tends to be a little “hot” in the mid and upper treble. 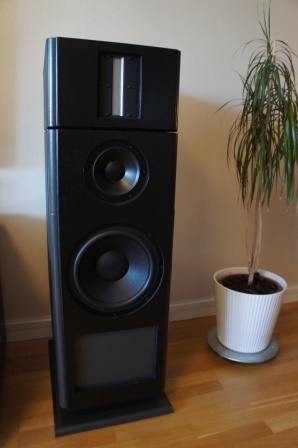 By using the appropriate amount of toe-in, I think this slightly added frequency response gives a more presence and airiness to the sound and are usually beneficial and desired. However, each design and the drivers used in it are unique and sometimes it might not work out properly. The cross-over simulations and measurements alone doesn’t tell if it’s good or not and I consider this and the tweeter level adjustments to be the voicing and fine tuning part of the loudspeaker design. 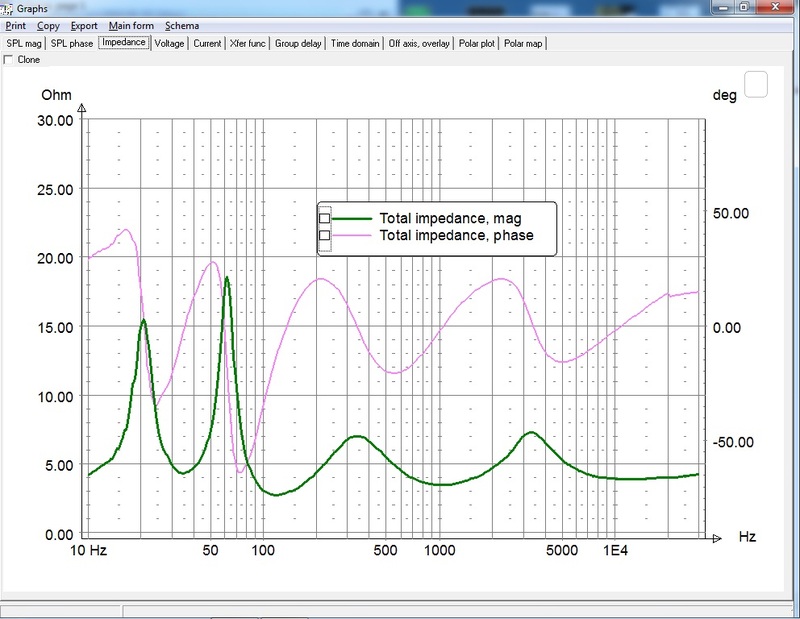 Left: 15deg off-xis frequency response (no smoothing applied). Right: 15deg off-xis frequency response with mid-range reverse polarity. The mid-range driver has a built in “BBC” response dip between 2-3.5kHz. The tweeter has a very extended and smooth frequency response, especially considering that this is a co-axial driver unit. The loudspeaker has a system sensitivity of about 88dB @ 2.83v/1m. When reversing the mid-range polarity we can see very deep notches around 590Hz and 2.8kHz at the cross-over frequencies. The deep notches indicate a very good phase response tracking and summation between the driver units around the cross-over frequency. 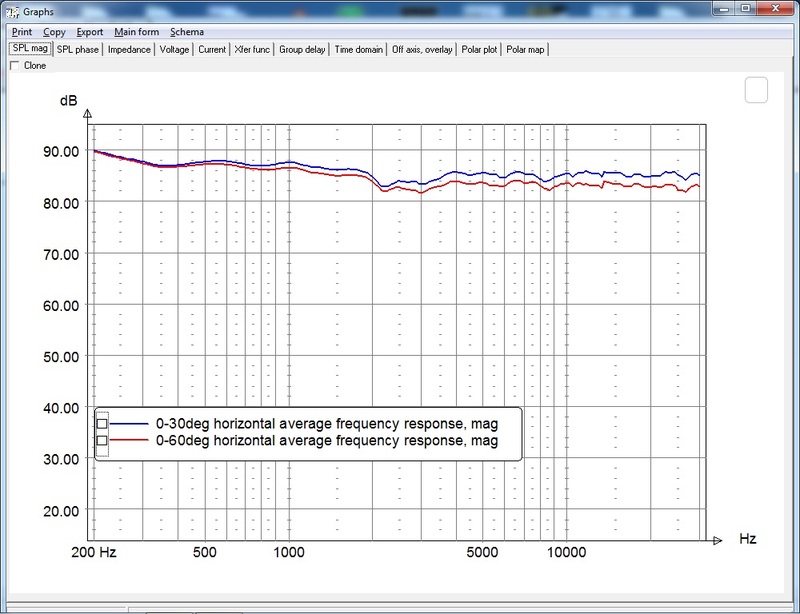 Left: Frequency response 0-60deg (no smoothing applied). Right: The frequency response curve is an average of four measurements (blue): on-axis, 15, 22.5 & 30deg and six measurements (red): on-axis, 15, 22.5, 30, 45 & 60deg. The loudspeaker has a smooth power response with a slightly downwards tilting response at higher frequencies. The tweeter has an extended frequency response with very wide off-axis dispersion. Left: Four different tweeter levels. The resistor R1 can be changed to fine tune the tweeter level. 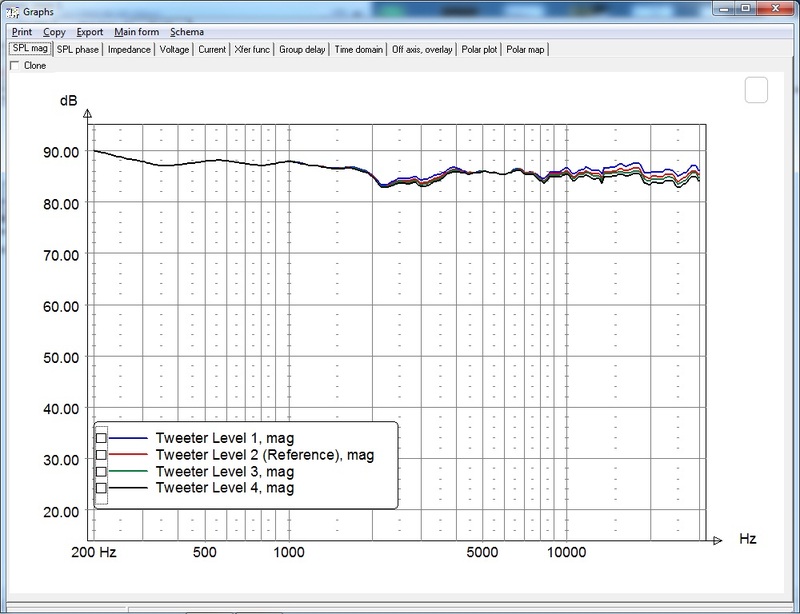 The level 2 is the “reference” level used in the above frequency and cross-over simulations. The minimum impedance occurs @ 120Hz and is slightly below 3 Ohms. 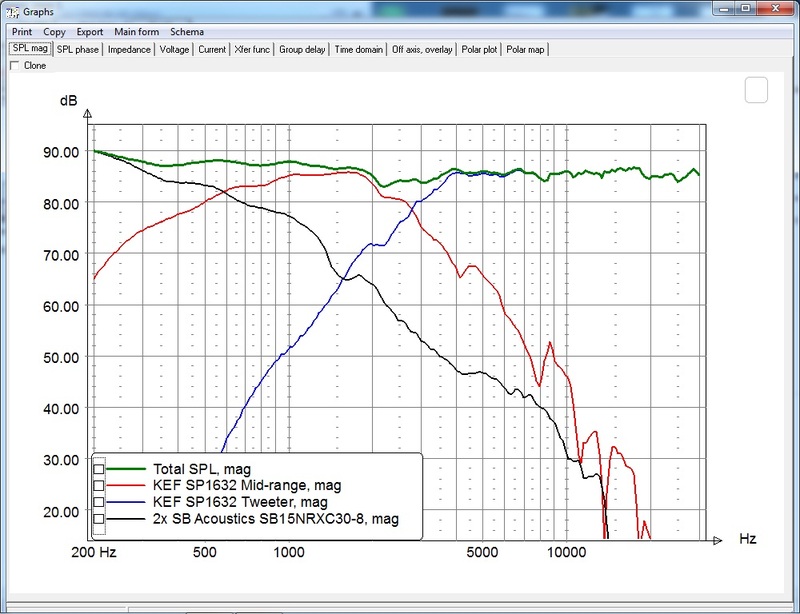 The system sensitivity of 88dB @ 2.83v/1m is mainly achieved by the low impedance driver units used in the loudspeaker. 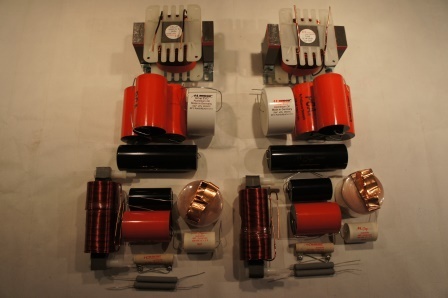 A 4 Ohm stable amplifier is recommended. As I said before, I don’t intend to make a clone of any of KEF’s loudspeakers and I don’t have a clue how the cross-over for KEF’s loudspeakers looks like, even though my chosen cross-over frequencies seems rather similar to those used in the R500 loudspeaker. It just happens to be very suitable frequencies to cross-over at. I would say that a suitable cross-over window is about +/- 100Hz from that I have chosen, at least the drivers seems to be engineered in that way. Read full article |Comments Off on Concentric Three – M5 Construction Update 1! Sequence Three – Grand Reference Construction Update6! Here’s a short update of the project progress! It’s progressing slowly, but I’ve finally finished building the front covers. The cross-over components has arrived and It’s time to bring out the solder iron and build the first cross-over that will be used in the first listening tests. The front grills are only used as protection covers and isn’t intended to be used while listening to the loudspeaker. The front grill covers are fastened with small magnets attached to the grill cover frame and snaps on to the baffle screws. Some quality cross-over components from Mundorf. Read full article |Comments Off on Sequence Three – Grand Reference Construction Update6! Concentric Three – M5 Construction! 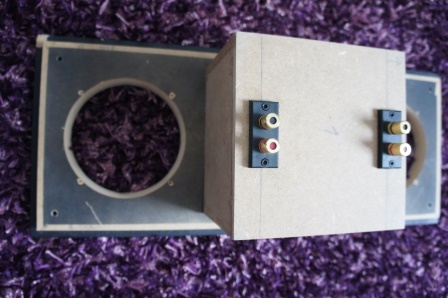 I’ve started the construction of the Concentric Three – M5 loudspeaker design. 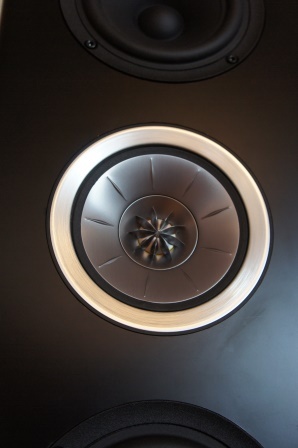 The main feature in this design is the KEF SP1632 co-axial driver unit. The KEF SP1632 is an aluminium/magnesium 5” mid-range driver paired with a 1” aluminium dome tweeter mounted in a wave-guide like setup. There are a lot of co-axial PA drivers available to DIY:ers, but there aren’t many so called HiFi drivers available to choose from. SEAS has a couple of drivers, but in my opinion none of them come close to the features and performance of this new KEF driver. Since the driver is a pure mid-range and cannot play bass, it has to be paired with a woofer or mid-woofer in a three-way design. In this first setup I chose to pair the KEF SP1632 with two SB Acoustics 5” mid-woofers in a Dáppolito configuration mounted in a Dayton 28 liter M-T-M enclosure. 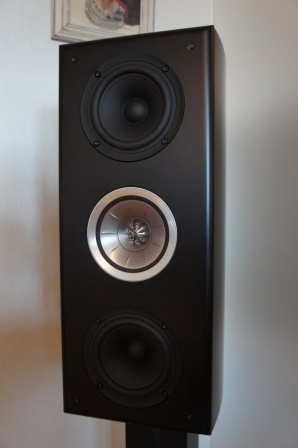 The KEF driver is mounted in a closed box with a net volume of about 2.5 liters. In the Dayton enclosure this leaves about 12 liters each for the two mid-woofers and is about optimal for these drivers. A port tuning between 38-40Hz seems feasible and will be tested. 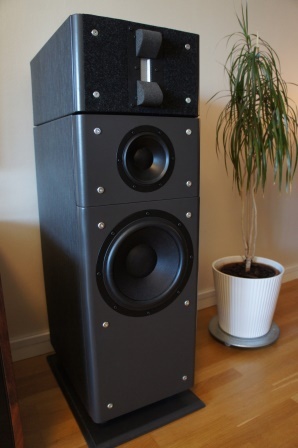 This loudspeaker could be built as a stand-mount monitor like I do or as a floor-stander, perhaps paired with an active sub-woofer in the excess volume of the floor-stander. One could say that this design very much look like the KEF R500, but let me point out that I don’t intend to build any sort of clone of the KEF “R” loudspeaker series. I don’t have a clue how the filter design used in this loudspeaker series look like besides the official specification about cross-over frequencies etc. In fact it’s not interesting at all, since all I want to do is to find a truly nice co-axial driver for my loudspeaker design and in this case the KEF SP1632 was the best driver I could find for my design needs. 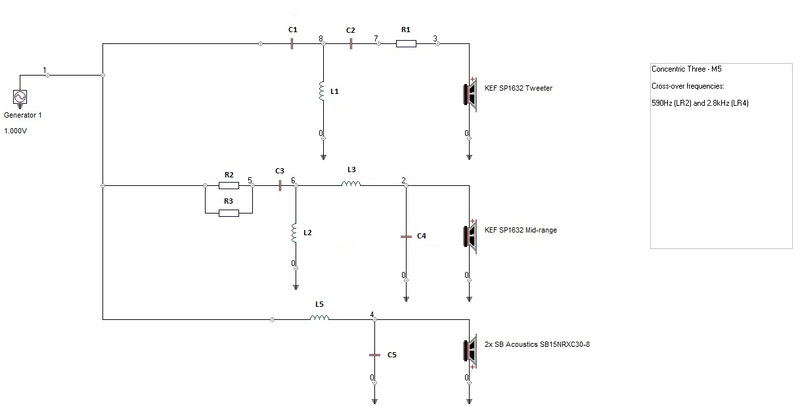 I will base my design on the measurements I’ve done on the SP1632 and that alone together with my own preferences will decide the cross-over topology cross-over frequencies and so on. As a DIY:er I have the advantage not having to consider making design choices based on reducing cost for e.g. the filter design. Consequently I will use the quality and the amount of cross-over components needed for the intended design. I don’t know if KEF has done such design choices with its R series designs, but for a commercial loudspeaker manufacturer like KEF they always have to weigh in production cost and often in this price range at the expense of a non-optimal performance. Currently I’m running the Concentric Three – M5 with my DEQX HDP-3 pre-amp in an active cross-over configuration using 48dB/octave phase-linear FIR filters with a cross-over frequency of 500Hz and 2.8kHz. I use my DEQX setup to burn-in the drivers and to get a general feeling of the driver’s characteristics and usable frequency ranges etc. Even in this early stage of construction and evaluation the sound from these KEF drivers is really nice and I’m looking forward to start with the passive cross-over design and simulations. Read full article |Comments Off on Concentric Three – M5 Construction! 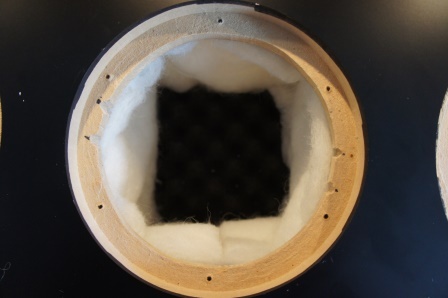 I’ve published a full set of measurements on the very nice KEF Uni-Q co-axial driver unit used in the KEF “R Series” loudspeakers. This co-axial driver is very well built and have average to good distortion performance and an outstanding frequency measurement performance. 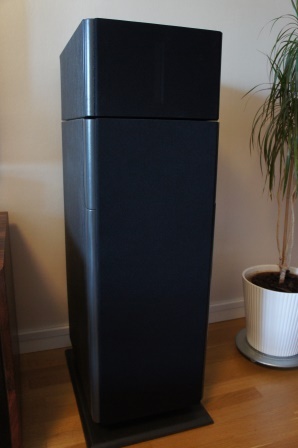 Details can be found here: “KEF SP1632”. 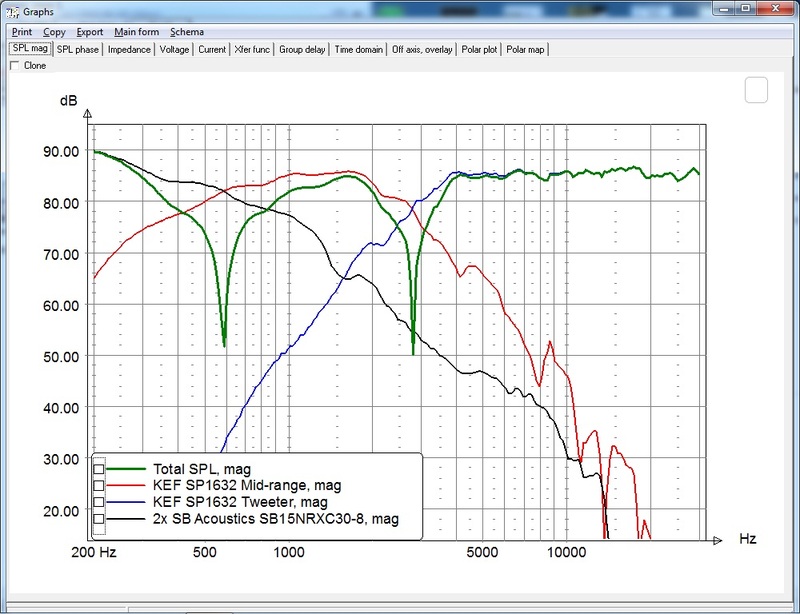 Read full article |Comments Off on KEF SP1632 Measurements!